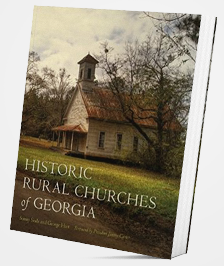 Learn more about Georgia’s rural churches and their historical significance by selecting a county from the map. These early rural churches are a vital part of Georgia’s history, and should be treasured and preserved for future generations. Georgia Public Broadcasting presents "Saving Grace"
Historic Rural Churches of Georgia presents forty-seven early houses of worship from all areas of the state. Nearly three hundred stunning color photographs capture the simple elegance of these sanctuaries.